The term BARF is an abbreviation that stands for “Biologically Appropriate Raw Food” or “Bones and Raw Food”. This has become increasingly popular over the past few years. In this article, you can read more about the history, background, advantages and disadvantages of BARF compared to a more tradition diet, such as Royal Canin dog food. The origins of this diet date back to around 1930; holistic veterinarian Juliette de Baïracli Levy wrote handbooks recommending that owners feed their dogs raw meat and bones (“The Complete Herbal Book for the Dog"(1950). Ian Billinghurst, an Australian veterinarian, is seen by many has the founder of the current BARF trend. He wrote the well-known book “Feeding the adult dog. Give your dog a bone“ (1993). Ready-to-eat meat foods. These are commercially available raw frozen foods. These foods are formulated as complete animal foods and should contain all of the required nutrients. BARF according to Ian Billlinghurst. This diet contains 60% raw meat, supplemented by a variety of ingredients that the dog (the wolf) would also eat in the wild, such as: green vegetables, organ meat, eggs and small amounts of grains and legumes. BARF according to veterinarian Tom Lonsdale is based on the composition of a prey animal. No grains, vegetables or dairy products are added. If possible, animal owners should strive to feed their animals the complete carcass. 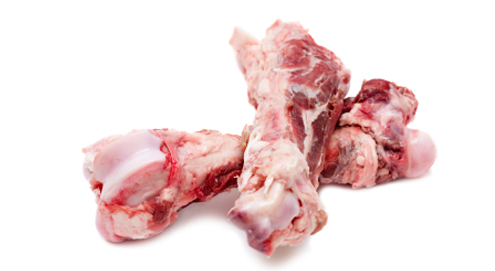 With just raw meat and bones, the dog or cat does not get a complete daily ration. It must be supplemented with nutrients such as calcium, phosphorus, Vitamins B, C and D and Omega 3 and 6 fatty acids. Our range includes BARF Diet for Dogs products such as various food supplements from Canina and Cdvet. Dogs' experiences with BARF are usually positive; stools decrease and are of higher quality, the skin is not irritated, ear infections disappear and the coat has a better gloss. The advantages of a BARF diet are not supported by scientific evidence. The positive effects described above are based on the experience of veterinarians and dog owners. What has been scientifically proven is the possible risk associated with feeding your animal raw meat. Raw meat can be infected with harmful bacteria, such as Campylobacter and Salmonella, which may cause serious gastrointestinal symptoms. This is why it is not advisable to give your animal raw meat if: you have a puppy or if you, your animal or someone in your household has a weakened immune system. Feeding bones also comes with the risk of sharp edges puncturing the stomach or bowel walls, resulting in adverse effects. If you are considering giving your dog and/or cat raw meat, please consult your veterinarian about the composition of the daily ration and have the diet checked by a competent body for completeness and balance if possible. You can also choose for a more conservative diet such as Farm Food, which is high quality and natural dog food without any preservatives. This dog food has been made from compressed pellets, ensuring no vital get lost during the production process. High level purity and a special way of producing gives your pet a shiny coat and healthy stool. If you are a dog owner that is looking for a different way to feed your beloved four legged friend then a fish diet could be an alternative. A fish-based diet of Fish4Dogs can provide a balanced and lovely meal that is packed with Omega 3 fatty acids and easily digestible proteins. Fish4Dogs ingredients are sourced from Norwegian fish farms that have clean, cold waters where no hormones or antibiotics are used. For extra resistance for cats & dogs. Essential vitamins & minerals for BARF Diet. For skin & hair problems. Promotes the overall condition of skin, coat & plumage.